For 2014, Ram 1500 is available with a diesel engine, making it the first half-ton pickup to offer a modern, clean diesel engine option (though there was a light-duty diesel option offered by Dodge decades ago). Also new for 2014 are new colors and chrome bits. Otherwise, Ram 1500 carries over unchanged. The current-generation Ram was launched as a 2009 model. The new 3.0-liter V6 diesel is rated at 240 horsepower, 420 pound-feet of torque, with an EPA-estimated 20/28 mpg City/Highway. It pairs with the 8-speed automatic transmission. Both the 3.6-liter V6 and 5.7-liter V8 gasoline engines carry over to 2014 unchanged from the 2013 model year, and they are paired with either a 6- or 8-speed automatic. Although GM and Ford offer a bigger, more powerful V8 than the Ram Hemi, only Ram puts the big engine in a regular cab model. 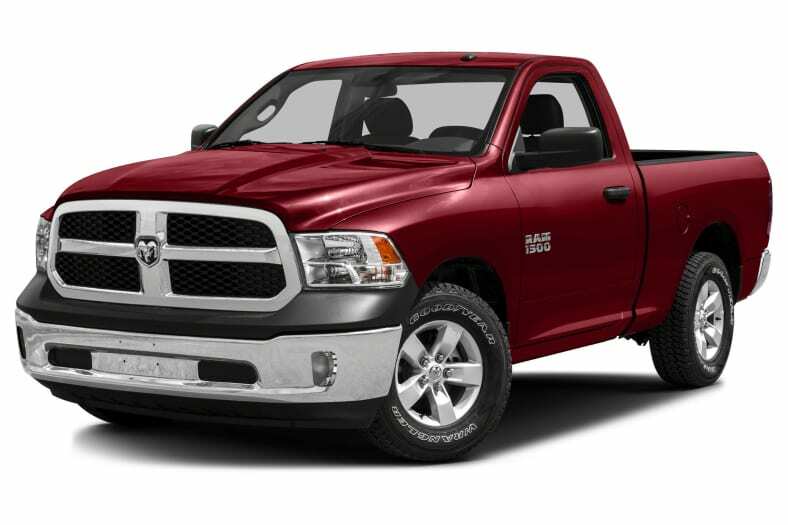 The 2014 Ram 1500 offers three cabs, three bed lengths (two with RamBox), three engines, two transmissions, two suspension arrangements, and interiors from hose-out ethic to limo substitute. Counted by cab, bed, drive and trim level, there are more than 70 Ram 1500 configurations, retailing from about $23,000 to more than $57,000. The Ram 1500 offers an optional full air suspension, with automatic leveling, entry/exit mode for easier cab access, and variable ride heights for on- and off-highway travel. The air suspension is available on any model except the new Ram HFE fuel economy special, which includes automatic start/stop engine operation and a bed cover. On the outside, Ram continues with imposing stature. Like many Dodge cars, the Ram's front end has a forward tilt, but it remains very aerodynamic. Detailing for the 2013 model year lowered the coefficient of drag (one aspect of total aerodynamic resistance) from 0.386 to 0.360, and both the diesel and HFE use grille shutters. The Ram 1500 is a conventional full-size pickup truck, but it differs in rear suspension and powertrains from all its competitors: primarily Ford F-150 and the Chevrolet Silverado/GMC Sierra twins and, to a lesser extent, the Nissan Titan and Toyota Tundra. Because the Honda Ridgeline does not have a separate frame, cab and bed, nor a choice of two or four-wheel drive, we do not consider it a conventional half-ton pickup, although those using a crew cab pickup primarily as a second car would be wise to consider the Ridgeline.